At least 11 mountaineers lost their lives while others are still missing when a devastating avalanche hit down the slope of Mount Manaslu in Northern Nepal, early morning of Sunday, September 23, 2012. The mountain climbers were fast asleep in their tents when the avalanche happened. The large mass of snow, described to be the size of six to seven football fields, swept down and destroyed the tents in two camping zones causing deaths and injuries to people. An avalanche is a massive snow or ice flowing down a slope as a result of an earthquake, erosion or glacier movements. If the avalanche is powerful, it can cause destruction to life and property. 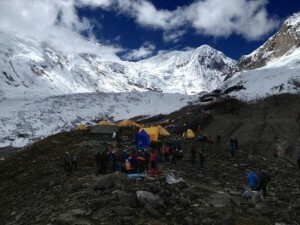 The avalanche is Manaslu was caused by glacier movement.